The light is always of the essence at Avril Gau. No rhinestones or glitter, yet enough brightness to dazzle the fans of its leathers in intense colours. So, city dwellers, enjoy; the boots of the winter 2017 are clicking on the pavement with style. And for the most original, dare the derbies in purple. An almost electric shade of purple will turn you into a Parisian rocker and your shoes will become the essential accessory for your next trip to London. On your return, stay in the spirit of Swinging London in black and white ankle boots with a psychedelic print. Patterns that are a tad extravagant, yet Avril Gau has the flair of making them balanced and above all, elegant. Since last summer, the footwear designer welcomes you to a store which had a makeover by artist Aurélie Rimbert. 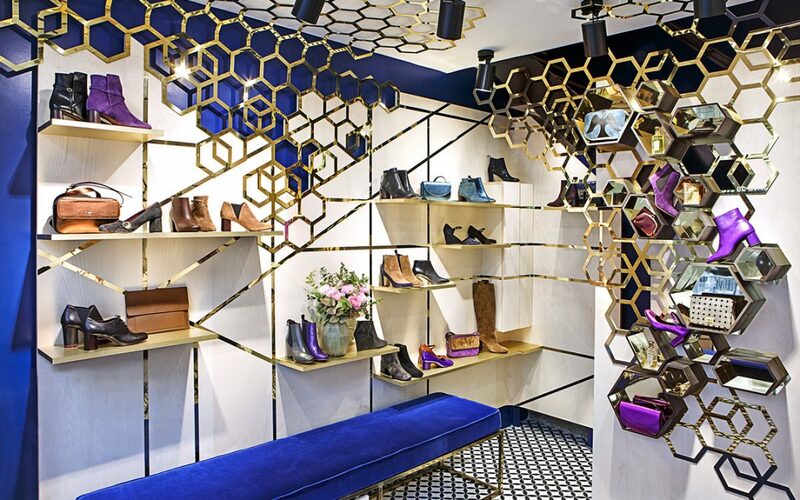 Golden brass mesh covers a part of the shop window and the showroom… a little touch of luxury in a chic atmosphere.